Finally got round to putting a few pictures of Barchester on here. Nothing most of you wont have seen before but at least I now have a presence. 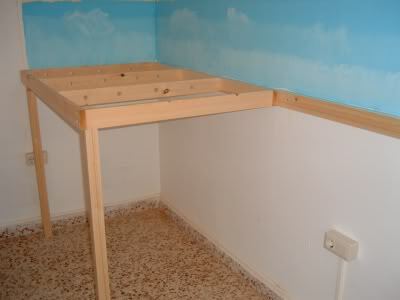 The beginning with 2x1 framework and 2x2 legs. 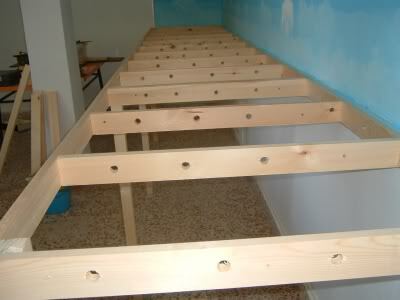 Six sections, five being 4 feet long and the sixth 4 'x1'. You can see the holes that have been drilled to take cables. A couple of steps onwards looking the other way. 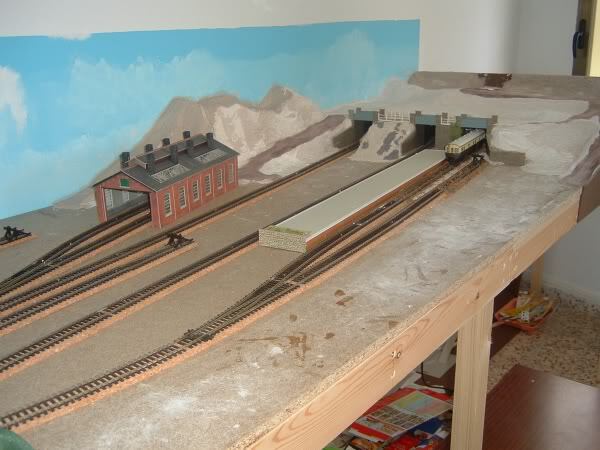 Where the scenery ends is the end of the first 20 feet beyond that is the 6'x1' section which is the 6 track fiddle yard. Also the inward operning window which threw all my careful plans into confusion. 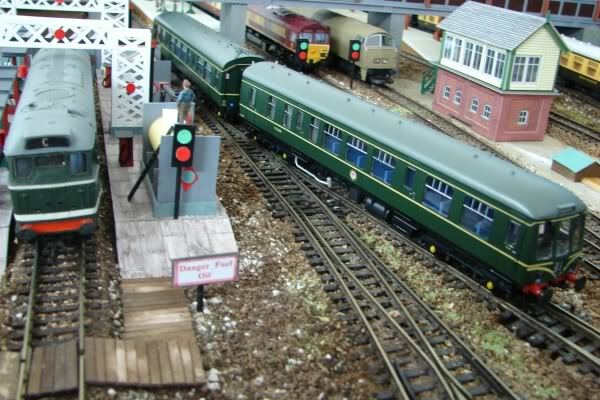 Here are some pictures of the latest addition to the Barchester fleet of DMU's. 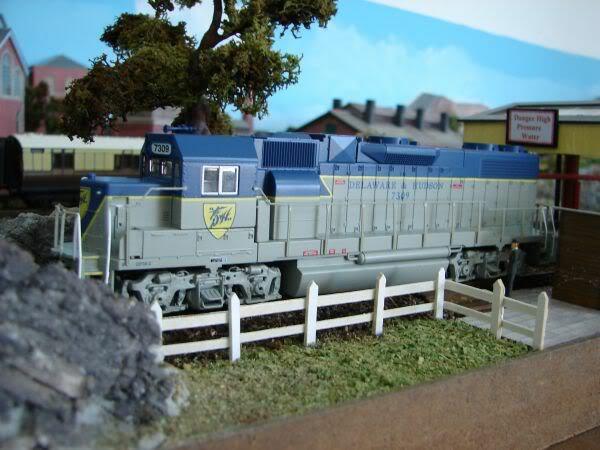 The Bachmann Class 108, a sweet runner that looks the part. 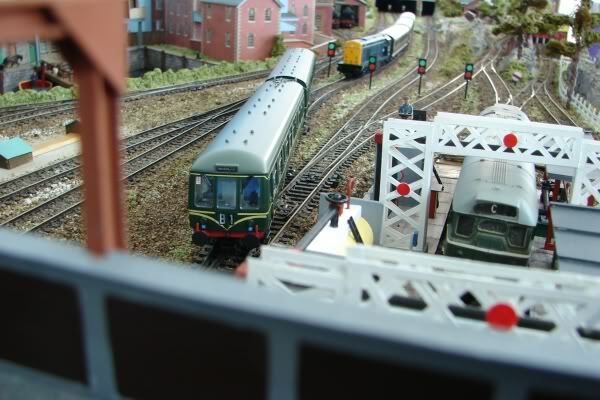 Two pictures showing it's inaugral run, departing from platform 5 to Ditton Heath. 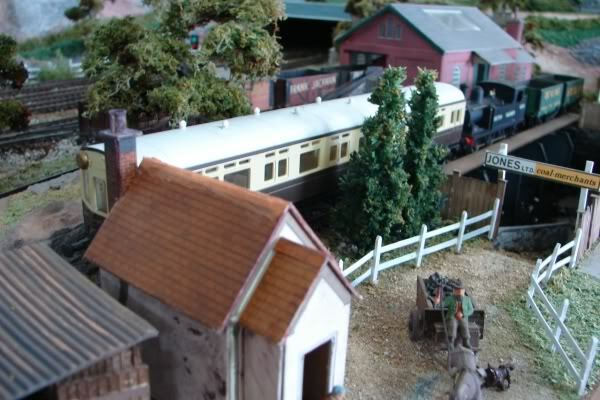 This picture shows the auto coach and little 0-6-0 shunted off into the Goods siding where it will wait until it's future has been decided. 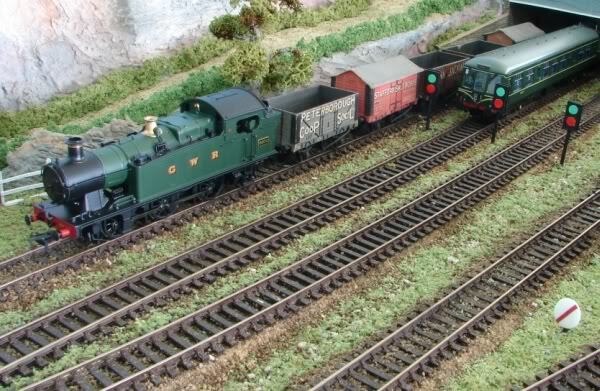 It's normal 3 times a day run between Barchester and the Dittons has been taken over by the Class 108 so things are not looking too good for it at the moment. 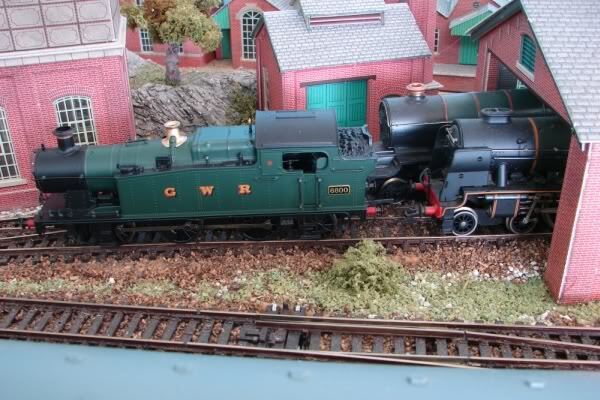 The 'Friends Of Barchester', a quite widespread organisation which is affiliated to the 'Barchester Preservation Society' (BPS) has offered to take care of coach and loco with costs and ownership remaining with the BPS. This offer is now under consideration. Here's a picture of the diesel wash unit at a quiet time of the day with the staff taking it easy. And then a shot over the roof of the main station building looking down into what is fast becoming a disused area of the town, needs some regeneration. Well here it is, the latest addition to Barchester's steam locos. Not really an addition as it is replacing one of the 'flooded out' engines that are just serving as decoration at the moment. I have to say that the running qualities are just as good as I have come to expect from Bachmann after months of running their diesel units. As far as the modelling goes I think it looks almost perfect without being too delicate to handle, a big plus for the younger modellers. Finally we see it on shed among it's bigger bretheren. 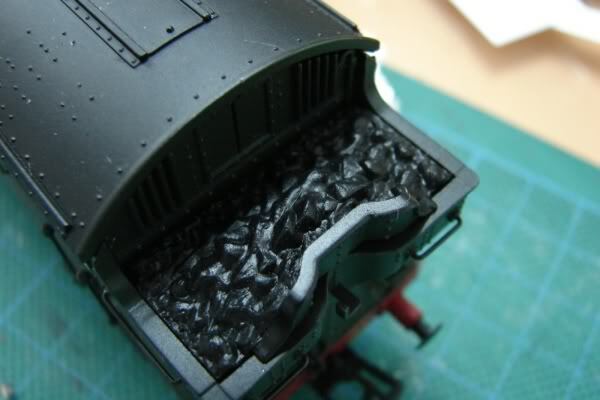 The coal in the bunker has a very shiny, plastic look about it so I thought about changing it. Had a look at the model and it isn't going to be a quick job getting the coal load out of the bunker. I had a gentle prise with the point of a knife but it is in there fairly solid. 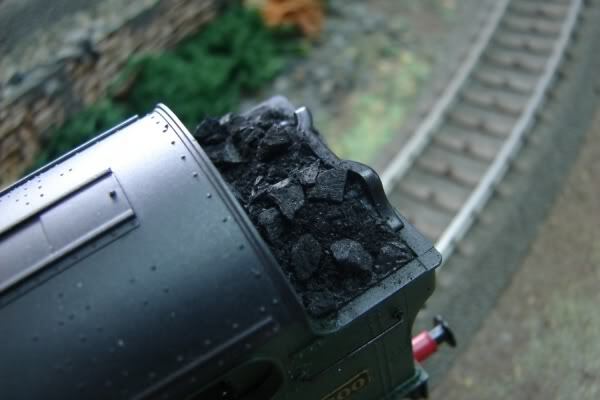 The first picture shows the plastic coal as it comes with the loco. Sprinkled a bit of crushed up charcoal on top of the coal load to see what it would look like, this is the result. It needs tidying up of course but should give you a good idea. You crush the coal/charcoal to your own needs of course. That's it for now chaps. Poor old Barchester has been pushed into the background lately and I can't see the situation changing for the forseeable future. Not this year anyway. These are super pictures, great to see Barchester back on the forum. A lovely lineup of photos, Bob. I'm very glad to see Barchester back. Congratulations on the layout Bob. When are you going to invite us all over for a first hand ride experience. Bob so pleased the Barchester line is back. If your DC i bet there is alot of wiring under that base board and what a nightmare it must off been to do. 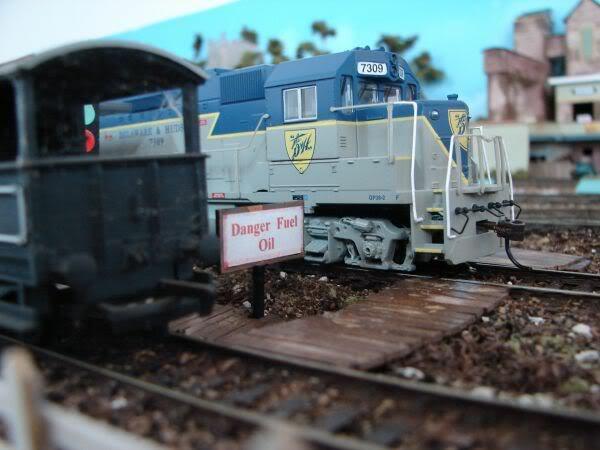 How do you control your engines and stuff around your layout Bob?. A most unexpected guest on the Barchester rails turned up this morning. 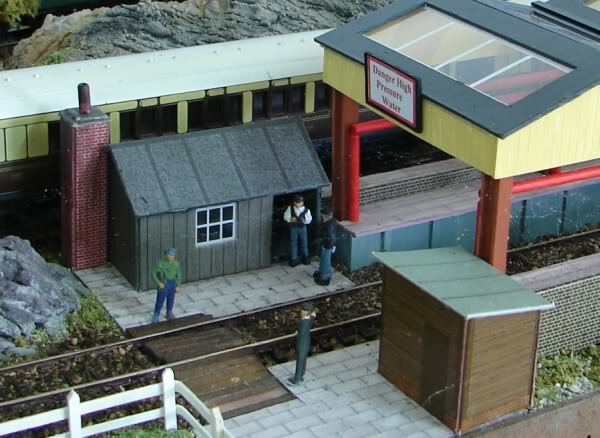 Even thought the loco is H0 scale it couldn't get itself into the Barchester wash unit. Although it did manage to squeeze itself, after a lot of hand waving and shouting, into the diesel refuelling point. Here it is balanced precariously over the coal drops with the timbers and walls creaking away as if about to collapse. In fact it did look about to topple right over at this point. What a monster. I believe the phrase is ... Phwoarrr! It's a beast! Delaware & Hudson - that's a fine choice of railroad, if I might say so :D :D We have two D&Hs here, plus plenty of hoppers etc. That Geep is a beauty, Bob, and I notice that the detail in the trucks as the Americans call them is very good indeed. Even some of the cheaper Atlas locos [more costly than yours, but lacking decoders] have the brake cylinder moulded in, so that under close scrutiny it doesn't even look like a separate part, because at the top it can be seen to melt back into the framework behind it. Not so on your Bachmann. Well done Bachmann. Unbeatable value at the price. Bob, that last picture looks terrific. 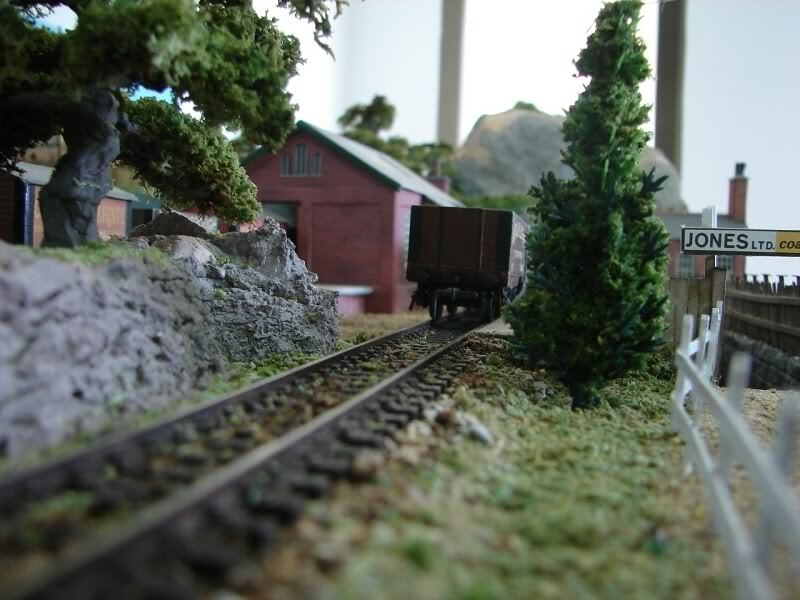 It looks like the loco is touching the layout (ground) along the side, is it? That's the wooden walk way over the coal drops Wayne and it is just being skimmed by the loco, and I mean skimmed, can't be much more than a couple of thou in it. 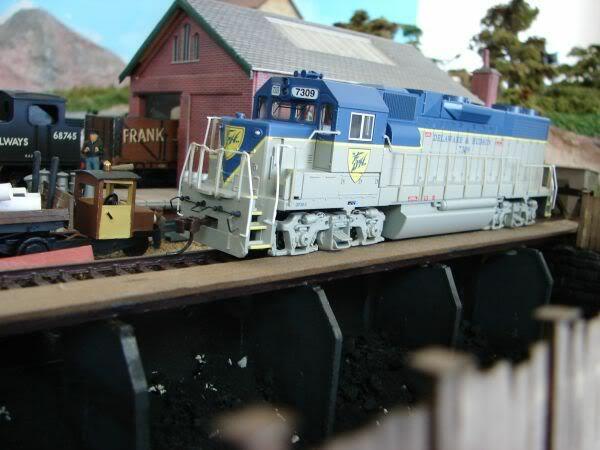 Bob, do you have any other loco's that are that tight to the walkway, or is it just this one? Did it scare you when you backed it in there? It did when I saw the picture because it looks as if it is certainly on it's way down the black hole of the coal drops. 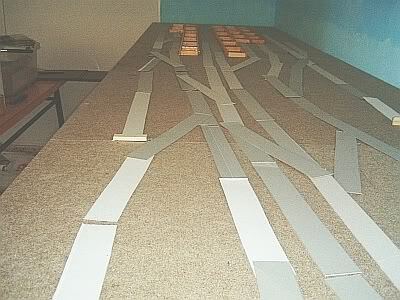 In fact it must be something to do with the way I have taken the picture as it is perfectly straight on the layout. 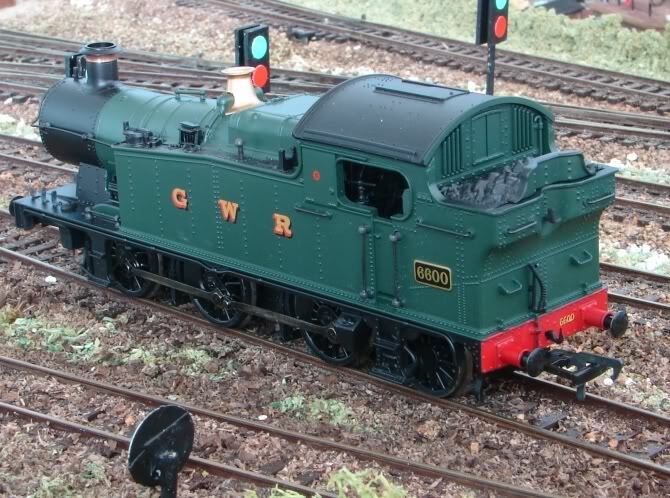 None of my other locos have underframes as low as this one and it's not a thing I ever considered before as after all these years I automatically know how high or low things have to be for UK model clearance. 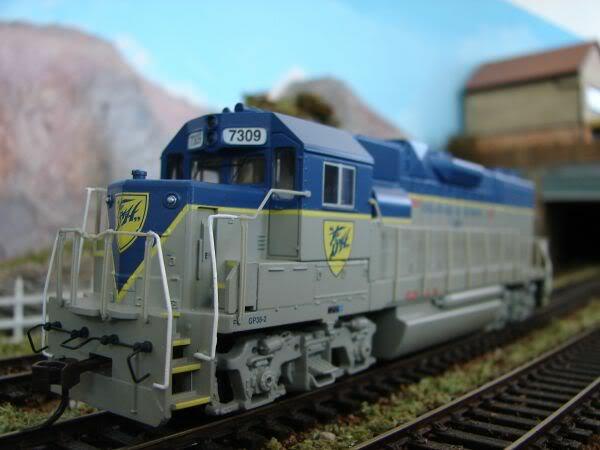 What surprised me most was that even though this model is built to a smaller scale than the rest of my fleet it still wouldn't go into the wash unit. If it's a fairly accurate scale model then it just shows how big the real thing must be. Sorry Phill, I didn't see your query about the wiring as I was too busy with the new loco. Anyway the wiring is just perfectly straight forward DC with all tracks controlled by On/Off switches and the turnouts by stud contact and electric pencil, everything done from the Control Panel. To operate I have a Gaugemaster walk about controller with cruise control and automatic acceleration and deceleration. Well thanks Bob, thought i was being ignored :evil: but now you have answered im ok now :D :D .